This is a movement that is going on all across the country, with new distilleries popping up all over. Besides making the obvious connection between the charred wood look and actual whiskey barrels, I found the rest of the article quite interesting. 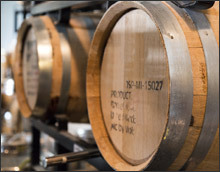 Although 95% of the world’s bourbon supply is still produced in Kentucky (a fact I didn’t know), craft distillers are helping to elevate the whiskey profile and market. As a result, sales demand has been increasing both here in the U.S. and abroad. Here at CMS, we have been involved with several commercial projects that have included bars and tasting stations, and we would enjoy the chance to help design and build a craft whiskey distillery or bar. If you haven’t had a chance to check it out yet, click here to view our gallery of recent Commercial projects.